This page explains meta-analysis of predictions that use binary Tests (Test Positive T+ and Test Negative T-) to predict binary Outcomes (Outcome Positive O+ and Outcome Negative O-), as calculated in the Meta-analysis for Predictions Program Page . In predictive tests, a high True Positive Rate (TPR) is often attained at the expense of having also a high False Positive Rate (FPR). Published results of predictive tests therefore vary accordingly, some with high TPR and high FPR, others low TPR and low FPR. Meta-analysis is therefore important in integrating multiple published results to obtain an overview of relationships between a particular Test with a particular Outcome. The model proposed by Moses and others (see reference) uses the concept of the Receiver Operator Characteristics (ROC), plotting the Sensitivity and Specificity of each study on the ROC chart, and develop statistical methods to fit a ROC curve over the data. From each study, True Positive Rate (TPR) and False Positive Rate (FPR) are calculated as follows. If there is any zero (0) values in the data, or if the second button "Do Meta-analysis Adding 0.5 to All Values in Data" is clicked, 0.5 is added to all values in the data. The reason for doing so is to ensure that there is no zero value in the data, which will crash the program with a division by zero error. Even when there is actually no zero value in the data, user may still choose to use this adjustment so that the results are comparable, as this adjustment is suggested by Moses et. al. (see reference), and thus the default in many algorithms. True Positive Rate TPR = TP / (TP+FN), False Positive Rate FPR = FP / (FP+TN). The table with data, with or without 0.5 adjustment, and the calculated FPR and TPR, is then presented. As data points near the extremes are unstable, and for prediction purposes, the data that counts are those with TPR>=0.5 and FPR<=0.5, only these data points are used in curve fitting. The procedures are as follows. b represents changes to the Log Odds Ratio related to changes in Standard Error, a bias caused by different sample sizes in the data. If b significantly deviate from null (0), then the Log Odds Ratio (y) is unstable, and the results of curve fitting difficult to interpret. If b does not significantly deviate from null, then the results of curve fitting can be taken to be free from bias and confidently interpreted. 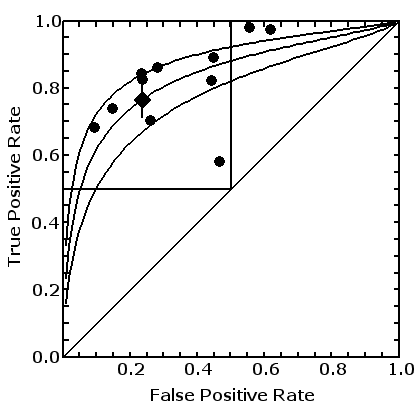 a represents the Log Odds Ratio when x, Standard Error = 0. Approximately, it represents mean Log Odds Ratio anyway if b is statistically not significantly different from null. Given that b is supposed to be null (0), the term ((1 + b) / (1 - b)) is closed or equal to 1, and is therefore optional. This term is included in the program in the Meta-analysis for Predictions Program Page , so the results may be marginally different from algorithms calculated without this term. This panel explains the results obtained from the example data used in the Meta-analysis for Predictions Program Page , as shown in the table to the right. Please note the data is computer generated to demonstrate the procedure, and they do not represent any real observations. 0.5 is added to all items to avoid a zero value, which will cause the program to crash. The actual data used is therefore as shown in the table to the left. Included also are the False and True Positive Rates (FPR, TPR) calculated. The studies where FPR<=0.5 and TPR>=0.5, 9 out of the 11 studies, are then used for curve fitting to produce the Summary ROC, with the following results. - As b is not statistically significant, we can rule out bias caused by Standard Errors. - The Standard Error of Q* SEQ* = 0.0258 95%CI = 0.7136 to 0.8149. Finally, the coordinates for all the data points from the input data. The 3 curve lines representing the 3 Summary ROC lines, mean, and 95% confidence interval. Moses et.al. (see reference) provide no algorithm for estimating the area. In fact the authors suggest that calculating θ may be inappropriate, given different sample size and variances from the different studies, and that estimating the Summary curve uses only a subset of the input data (those with TPR>=0.5 and FPR<0.5). Moses LE, Shapiro D, and Littenberg B(1993) Combining independent studies of a diagnostic test into a Summary ROC Curve: Data analysis approaches and some additional considerations. Statistics in Medicine 12:p1293-1316.